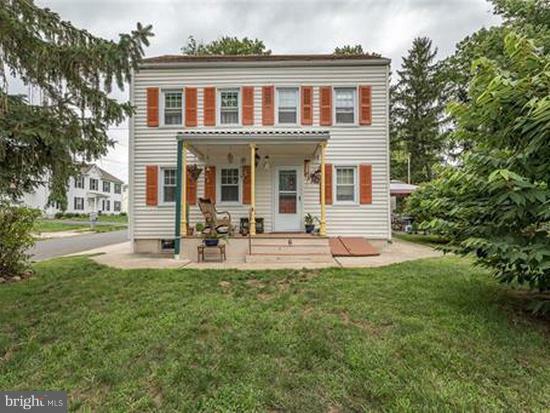 Wonderful colonial style Farmhouse home in Great condition located in lovely Historic North Crosswicks in Hamilton Twp. Large 296 x 101 lot provides possibility to subdivide! You could sell the bonus lot, or possibly build another home yourself! Talk about solid added value! (Twp requires 15, 000 sq ft lot minimum) This well maintained home has 3 bedrooms, with the option of using the den as a 4th bedroom, and 2 full baths. The living room has a gorgeous brick fireplace, and the front office has custom built-in oak cabinet and shares the 2nd dual sided fireplace with the dining room. The newer Eat-in Kitchen is very spacious and offers recessed lighting, lots of oak cabinetry, abundant counter-top space and a dining area. There is a rear Addition off the kitchen featuring lots of windows that provide views of the beautiful yard, brick patio area and let in plenty of sunlight. Completing the first level is a full bath with custom marble tile. Upstairs, there are 3 sizable bedrooms all having good closet space, as well as a large landing area with double closets that will work great as a reading room or study area. A large full bath and laundry closet finish the remainder of this level. The home has a large finished walk-up attic that could be used as a childs bedroom or play-room, dual staircases, newer vinyl windows, updated electrical system, newer hot water heater, French drain with back-up sump pump, large storage shed, Big deep yard with plenty of space for entertaining, playing soccer/football, or installing a pool or pole barn. This home is truly a pleasure to see, and close to highways, shopping and restaurants, but located in a peaceful and serene country town. Being sold as-is.